Abstract: Mucosal tattooing and packed eyeliner cosmetic tattoo treatments are controversial, advocates say they can perform them safely but others are not so sure, this article discusses the current research. Eyeliner tattooing has been widely available for several decades and the overwhelming majority of clients who have undergone this service describe satisfaction with the outcomes and no lasting negative effects. The focus by industry members has been mostly centred on achieving aesthetically pleasing results and some have concentrated on procedural safety with particular emphasis on management of risk factors and avoiding complications. In spite of the low incidence of adverse outcomes two types of eyeliner services have remained controversial, mucosal tattooing and packed eyeliners (implanting high concentration of pigment) these services are not performed by all cosmetic tattooists, those who do provide these services claim to have numerous clients that have had uneventful recovery and some believe that this is a debate related to the skill of the technician, yet others believe that this is a debate purely related to the eyelid anatomy and the risk profile of the treatment1. 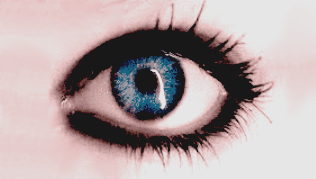 All of the ophthalmologists that we have spoken with have expressed concern about both mucosal tattooing and packed eyeliner treatments stating that the apparent lack of immediate symptomology after these types of treatments is purely anecdotal and should not be construed as evidence of long term safety. In July 2015 a small scale study involving 40 patients (10 with eyeliner tattooing and a control group of 30 without) was published in Cornea The journal of Cornea and External Disease. The researchers discovered a marked difference in Tear Film Break-up Time (TBUT) in the tattoo group (4.3 ± 0.9 seconds) compared to the control group (11.0 ± 4.3 seconds; P < 0.001), Meibomian gland loss was higher in the tattoo group (3.4 ± 1.5) compared to the control group (0.9 ± 0.6; P < 0.001) and there appeared to be a direct relationship between the tattoo score/proximity to the Meibomian glands2. The publication 'Eyelid Tattooing Induces Meibomian Gland Loss and Tear Film Instability' is important medical research directly related to eyeliner tattooing yet most technicians and trainers seem either unaware of the publication or are unaware of the implications of the findings of the researchers. Q: What was the relationship between the eyeliner tattoo and the signs observed by the researchers? A: The simplest explanation is that the closer the tattoo pigment was to the Meibomian glands and the greater the tattoo score the more likely the patient was to have Meibomian gland loss/dysfunction and consequential effects on their tear film. Q: What does Tear Break-up Time (TBUT) mean? A: Each time that we blink the tear film is spread across the eye surface to keep the eye moistened and healthy, the TBUT is a test performed to measure the number of seconds that pass without blinking before the tear film that was spread across the eye surface breaks down and dry spots begin to appear, usually the test is performed with a stain (fluorescein) inserted in the eye and the eye is examined under high magnification (slit lamp) to make the tear film more visible by an ophthalmologist. If the TBUT is too short then it indicates a problem with the quality and or quantity of the tear film, in the study mentioned above2 the results suggested that a reduction in Meibomian gland oil production was adversely affecting the quality of the tear film in some patients. Q: Would a patient experience symptoms due to their shortened TBUT? A: It is possible that some may have symptoms but not necessarily in the early stages because symptoms of dry eye syndrome will become far more noticeable as the TBUT becomes close to or less than the blink rate, in other words when the tear film breaks down as fast as the person is blinking this results in constant drying of the ocular surface. In the initial stages the patient may compensate by increasing their blink rate and they may not be conscious of this to begin with. The signs detected by the researchers if applied to a large population might be sub-clinical in some patients, i.e. the patients might have had detectable signs of dry eye (what an ophthalmologist could see) but initially a patient with Meibomian Gland Dysfunction (MGD) may not experience significant symptoms or visual deterioration. However over time it is possible that those with low Meibomian scores may develop more noticeable dry eye symptoms with advancing age, some may develop dry eye symptoms sooner than they otherwise would have, some may develop symptoms when they otherwise may never have developed dry eye, and others might never develop symptoms even with those changes. Q: How important are Meibomian glands in relation to the quality of tear film and does this cause a different type of dry eye? Mucous Layer - Mucin (composed of glycoproteins) is produced by tiny goblet cells across the ocular surface. 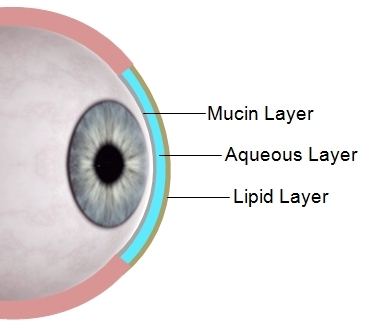 Mucin is hydrophilic (having a strong affinity for water) and it plays an important role in stabilising the tear film by helping the fluid layer adhere to the eye surface, the amount of mucin is incredibly small measuring only 0.8 - 1.4 microns3. Without mucin the aqueous layer would just flow off the ocular surface without moistening it (much like water just beads and runs off the windshield of your car). Loss or reduction of mucin layer can cause evaporative dry eye (loss of tear quality), it might be easier to conceptualise if thought of as 'non-adherence dry eye' because its not so much an evaporation problem as a loss of tear adherence to the eye surface. Sometimes people with loss of the mucin layer may actually produce excessive tears as the lachrymal gland tries to compensate for loss of tear adherence by producing lots of fluid so the patient ends up with tear overflow (lots of poor quality tears running over the lids and down the face). Aqueous Layer - Fluid produced by the lachrymal glands (contains water, electrolytes, hormones, immune antibodies etc). Loss or reduction of aqueous layer can cause hypovolemic dry eye (loss of tear volume) or dry eye due to disturbances in the electrolytes can also occur (loss of tear quality)4. Lipid Layer - Meibomian glands are specialised sebaceous glands that are concentrated near the lid margins, they produce lipid (oil) secretions, the oil within the tear film reduces the evaporation rate of the tear film on the ocular surface. Loss or reduction of lipid layer can cause evaporative dry eye (loss of tear quality). Quantitative - disturbances in tear volume. Qualitative - disturbances in normal tear components. Q: How exactly does impairment of the Meibomian glands cause evaporative dry eye? A: Tear film is spread across the eye surface by the eyelids when we blink (similar to a windshield wiper spreading a film of rain over a car window) and because the tear film is an extremely thin layer of fluid it is highly susceptible to evaporation. Ambient temperature - Fluid evaporation occurs faster with increasing temperature. Air movement - Wind, fans, heater/cooler blowers, draughts etc will increase evaporation rates, therefore dry eye sufferers tend to be intolerant of windy conditions. Relative Humidity - As humidity increases the evaporation rate decreases and the air itself begins to feel more comfortable for dry eye sufferers, conversely the lower the relative humidity is the faster the evaporation rate. For this reason dry climates, dehumidifiers and reverse cycle air-conditioning all tend to increase the discomfort for dry eye sufferers. The Water-Air contact surface area - The larger the water-air contact surface area is the faster the evaporation rate will be. You may notice that in addition to increasing their blink rate dry eye suffers may also tend to squint a little this is a subconscious attempt to reduce the water-air contact eye surface area. As depicted in the illustrations above the oil that is produced by the Meibomian glands tends to coat the surface of the tear film which reduces the evaporation rate by decreasing the Water-Air contact surface area and by increasing the viscosity of the tear film. You can conduct a simple experiment to test how important the oil produced by Meibomian glands is in reducing evaporation by filling two glasses with an equal amount of water and then adding a small amount of cooking oil to one of the glasses, you will notice that the oil floats on the surface. 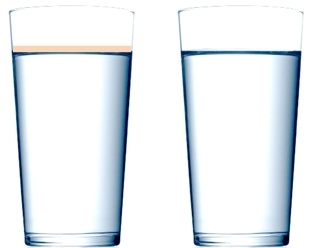 If you mark the level of water in each glass and then leave them for a few days you will discover that the glass without the oil on the surface evaporates much faster than the one with the oil. A study conducted by Mishima and Maurice in 1961 reached the conclusion that the Tear Film Lipids Layer (TFLL) reduced evaporation rate of the tears by a factor of about 15 times5, some later studies conducted in vitro (in the lab) that tested thin layers of meibum on a beaker of saline found little impact on evaporation rates6 however a more recent study by Bhamla et al. confirmed that TFLL was an effective evaporation barrier particularly on small areas of tear film7 it is now widely accepted that Meibomian glands play a crucial role in reducing evaporation of the tear film and maintaining a normal Tear Film Break-up Time (TBUT)8. Q: How many Meibomian glands are there in each of the eyelids? 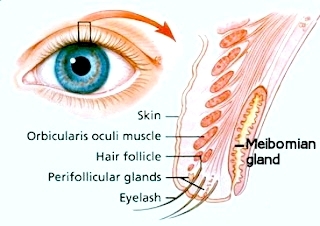 A: There are approximately 30-40 Meibomian glands in the upper eyelid and approximately 20-30 in the lower lid9 amounting to a total of about 60 glands supporting the tear film on each eye, with such a small number of glands it is easy to understand that if even a small number of them are damaged either during or after cosmetic tattooing it may have an effect on the quality of the tear film. For example if just 3 glands were permanently destroyed/dysfunctional in each lid that could cause a 10% reduction in lipid content in the tear film. Q: Have other members of the medical community made reference to the 'Eyelid Tattooing Induces Meibomian Gland Loss and Tear Film Instability' in other publications? A: Yes the report has already been cited in other journals and patient case reports10,11,12. "We all know that healthy Meibomian glands are essential in maintaining tear film stability and a healthy ocular surface, so when patients with eyelid tattoos are examined it is worth carefully checking them for signs of MGD and evaporative tear dysfunction." The fact that the report has not gone unnoticed by the Ophthalmology and Optometry community and coupled with prior case reports of similar nature14 this should be sufficient for the cosmetic tattoo industry to sit up and take notice. Morrison et al. in their case report "My Tattoos Caused My Dry Eye?10" elude to the possibility that proximity of pigment may also play a role in causation of Meibomian gland dropout. Q: What importance should cosmetic tattooists place upon the report 'Eyelid Tattooing Induces Meibomian Gland Loss and Tear Film Instability2'? A: The report is a small scale study and a larger study with more patients and over a longer time frame would be useful to provide us greater certainty about the full implications and longer term effects, however as far as we are aware this is the first study providing a direct connection between Meibomian gland loss relative to the extent/proximity of eyeliner tattooing correlating with a measurable impact on TBUT and associated impact on the health of the ocular surface i.e. some objective evidence of cause and effect. Therefore the study and its findings are very significant and cosmetic tattoo technicians need to be aware of the potential implications particularly in relation to some types of eyeliner services. Q: What type of eyeliner tattooing is most likely to have an effect on Meibomian gland (MG) damage/loss and a reduction in TBUT? Q: Some manufacturers and trainers advocate the use of high impact force devices, but is there actually scientific support for need for high force devices for cosmetic tattooing? A: This is a topic that we are covering in great detail in our new course which helps dispel some myths that are sometimes perpetuated; ©Biomechanics for Cosmetic & Medical Tattooists. Overcoming the epidermal barrier has a direct relationship with the quality and profile of the needle, sharp needles require negligible force, grouped needles slightly more force and poor quality needles with jagged edges, bent shafts, or burs will require more force to penetrate the epidermal barrier. Studies related to a range of biomedical needle insertion procedures demonstrate that at the point of skin penetration the insertion force increases in non-linear increments proportional to the depth of penetration due to frictional drag15-17, however the force required to overcome the affects of frictional drag below a depth of 5mm are minimal15. 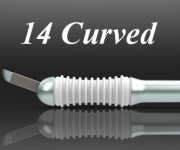 It needs to be stressed that the studies indicate that insertion friction and the penetration force required to overcome friction are proportional to insertion depth (non linear), however with cosmetic tattooing insertion and retraction friction are minimal because of the shallow insertion depth. What many cosmetic tattoo technicians incorrectly interpret as the force required to penetrate the epidermal barrier is in reality just the need to overcome Skin Viscoelasticity18, this requires training in the correct technique for cosmetic tattooing not a quest for machines with greater force to compensate for any deficiencies in technique. During cosmetic tattooing the needle impact force dissipates into skin in the form of kinetic energy and heat, if you watched a video of a tattoo needle entering the skin in slow motion you may notice the needle impact force dissipating energy in the form of a cavitation wave. Extremely small delicate anatomical structures such as Meibomian glands may be susceptible to damage not only from direct injury by a tattoo needle but also due to kinetic energy shock from the use of high force equipment. 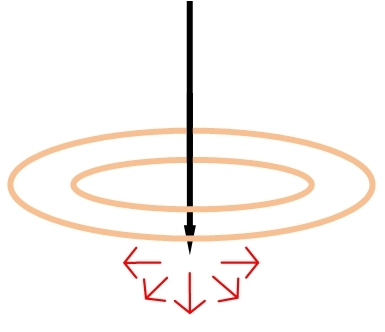 You can see from the above that with services such as eyeliner tattooing the penetration force required is actually minimal, the main source of resistance relates to skin viscoelasticity15-18 therefore the focus should be on improving technique and preferential use of lower force equipment. Q: If a few Meibomian glands or their orifices were damaged during an eyeliner procedure due to mucosal tattooing, pigment packing, or high force equipment and the client did not develop any eye symptoms immediately after healing would this mean that any damage caused was not sufficient to ever cause dry eye symptoms? A: This is precisely the reason why additional research would be helpful to clarify the exact answer to that question. 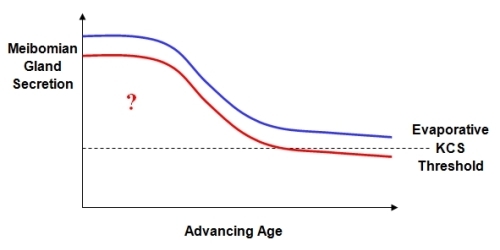 As we age there may be the tendency for our Meibomian glands to become smaller and less productive resulting in an increase prevalence of evaporative dry eye disease with advancing age19-24. If a few Meibomian glands were damaged during or after eyeliner tattooing due to mucosal tattooing, pigment packing, or use of high force equipment then the obvious question that is raised by the report2 from Young et al. is; would minor/moderate damage increase the prevalence of evaporative dry eye disease later in life as the remaining Meibomian glands began to deteriorate with advancing age? The simulation above illustrates this important question, i.e. would some forms of eyeliner tattooing have the potential to cause a shift towards or below the threshold for evaporative KCS either shortly after tattooing or later in life due to minor or moderate Meibomian gland drop out? NB. This highlights why all technicians and trainers need to be conscious of the higher risk potential associated with some types of eyeliner treatments and existing case reports of adverse outcomes25 as this may have future medico-legal implications for those providing the higher risk procedures. Q: Which anatomical region of the eyelid has the highest risk of damage to Meibomian glands? A: On the cross sectional slide below marked with a dotted line you can see the region on the lid that poses the greatest risk of damage to tarsal glands during eyeliner procedures. There are a lot of very delicate structures within the eyelid within an average width of 3.06mm - 4.86mm (SD 0.3-0.4mm)26, in addition to the Meibomian glands (concentrated near the lid margin and mucosal surface), other small anatomical structures such as the glands of Moll (sweat glands) and the glands of Zeiss (sebaceous glands), the Tarsal plate, lachrymal drainage apparatus (particularly the puncta's), blood vessels and nerves (Infratrochlear, Supratrochlear, Supra-orbital, Infra-orbital, Lacrimal) in other areas of the lid are also potentially susceptible to damage by a tattoo needle. Penetrating the lid too deeply (even from outside the lash line) could also damage the tarsal glands from within the inside of the lid or even cross lid. Also pigment packing in or near this region may pose a higher risk, high concentrations of pigment might affect the oil secreting glands due to clogging of ducts and orifices, infiltrating the glands themselves, overcrowding the glands or interfering with blood supply to the gland or via direct contact irritation to the glands and orifices10,25. Q: Is dry eye a relatively minor problem or can it have an impact on quality of life? A: The answer to that question depends upon the severity of the condition though no form of dry eye should be considered trivial. A study from the Division of Preventive Medicine, Brigham and Women’s Hospital (B.M., D.A. Schaumberg); and Schepens Eye Research Institute Departments of Medicine and Ophthalmology, Harvard Medical School Boston Massachusetts, found that those with Dry Eye Syndrome were more likely to report problems with; "reading ([odds ratio] OR 3.64); carrying out professional work (OR 3.49); using a computer (OR 3.37); watching television (OR 2.84); driving during the day (OR 2.80); and driving at night (OR 2.20)27". Dry Eye Syndrome can have a major impact on vision related quality of life. If lipid secretions are impaired even slightly due to dysfunction of Meibomian Glands after eyeliner tattooing as a result penetrating too deeply, excessive trauma, packing pigment or tattooing the mucosa then it may not be until later in life that the clients dry eye symptoms actually manifest as the remaining glands decrease production with advancing age and the gland secretions drop below dry eye threshold. Dr. Weidmayer OD commented that; "pathologic Meibomian gland changes observed over time after eyelid tattooing should be further investigated before firm conclusions are drawn from this single small study.11" highlighting that additional research would be of assistance in quantifying any increased risk of developing evaporative eye disease among those with eyeliner tattooing vs. the general population. Also any subsequent research should include important information such as the type of tattooing that was conducted, the anatomical location of the tattooing, as well as the type of pigment and equipment that was used to identify specific causation. Dr. Zwerling has also commented that there are new specialised techniques for photographing and documenting the structure and function of the meibomian glands and these could be used in any future studies, for example Fluorophotometry, lipid analysis using mass spectroscopy or thinlayer chromatography, Ora’s Lid Imaging System and the LipiView Ocular Surface Interferometer28. Until such time as we have the benefit of additional research it would be advisable for cosmetic tattoo technicians and trainers to avoid providing eyeliner tattoo services in a way which may increase the risk of damage to Meibomian glands as is described above. Special thanks to Dr. Linda Dixon & Dr. Charles Zwerling for Pre-Publication Academic Review.